In Kyoto there is a tram called Keifuku Arashiyama Line also known as Randen. This small train connects the busy, bustling Shijo Omiya area with the quiet Arashiyama Area. Randen might not be the best option for visiting Arashiyama, since it takes more time than other trains such as JR Sagano Line (20 mins from Kyoto Station) and Hankyu Line (20 mins from Kawaramachi Station). To take advantage of this tram, buy Randen One Day Free Ticket (500 yen). With this ticket, it is possible to visit all these places for 500 yen (this does not include fees needed for each spot). This ticket is available at Shijo Omiya Statio, Katahiraotsuji Station, Arashiyama Station and Kitano Hakubaicho Station or hotels including Kyoto Kokusai Hotel, Hotel Kiehan Kyoto, Mitsui Garden Hotel Kyoto Shijo, Toyoko INN Kyoto Shijo Omiya, Hotel Oaks Kyoto Shijo, Rhino Hotel Kyoto. 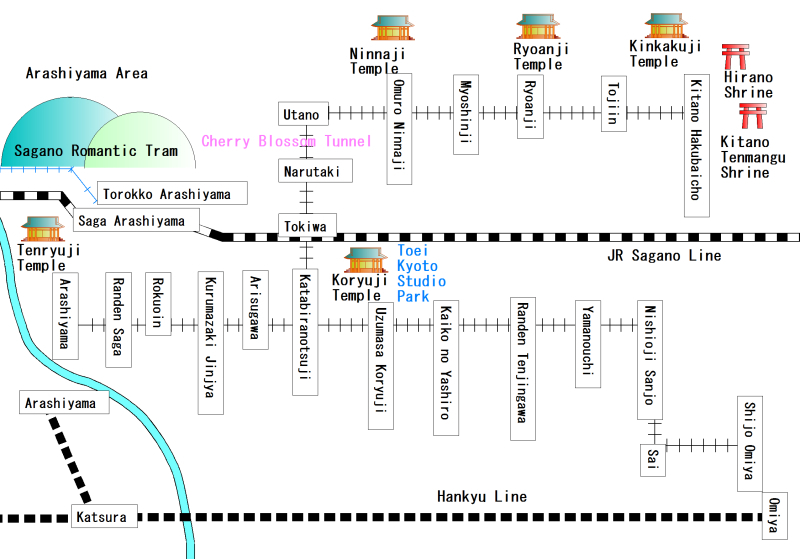 There are more useful and fun information on my Kyoto e-Guidebook. It is available on Amazon now.